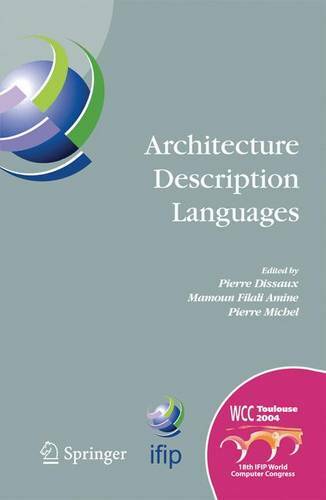 Architecture Description Languages is an essential reference for both academic and professional researchers in the field of system engineering and design. The papers presented in this volume were selected from the workshop of the same name that was held as part of the World Computer Congress 2004 Conference, held in Toulouse, France in August 2004. This collection presents significant research and innovative developments and applications from both academic researchers and industry practitioners on topics ranging from Semantics to Tool and Development Environments. The aim of an ADL is to formally describe software and hardware architectures. Usually, an ADL describes components, their interfaces, their structures, their interactions (structure of data flow and control flow) and the mappings to hardware systems. A major goal of such description is to allow analysis with respect to several aspects like timing, safety, reliability. The papers in this state-of-the-art volume cover such topics of interest as components, connectors, composition; semantics and formalization; verification, simulation and test; tools and development environments; standardization; industrial projects. To encourage closer interaction between academic and industrial networking research communities, the workshop welcomed academic research papers as well as industrial contributions, and both are included here. Which makes this collection important not only for ADL experts and researchers, but also for all teachers and administrators interested in ADL.